Glacia Wedding Invitations, Unique DIY Glamorous Silver and White Kit. RSVP set is the very handsome Italian pearlescent Pearl white A2 size envelope and the matching Pearl Cardstock for the RSVP Card (4.25x5.5 inches). Secures to the portfolio with photocorners. Glamorous Portfolio Invitation in Silver and Cool White. Perfect for a two language invitation. DIY portfolio wedding invitation made from shimmery Italian pearlescent papers. 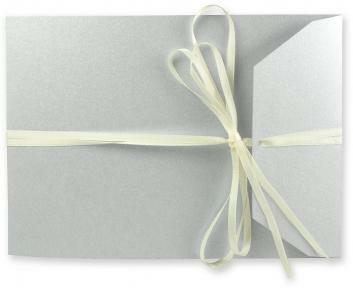 Long length of ivory double face stain, so you can wrap the ribbon around the invitation multiple times. EXTRA INVITE SHEET for two language invitation is 25 cents. You would then put the rsvp set at the back of the invitation, held by the binding ribbon. PAPER FACTS: Paper and envelopes are made from FSC certified paper, made without metal or foils, is recyclable, biodegradable, elemental chlorine free. These papers are made in Italy. Colors: Shimmery silver and cool pearl white, with ties of ivory satin ribbon and photocorners. Colors: Silver, pearl white and ivory. Mailing Envelope:Matching pearl white A7 pearlescent envelope. Photocorners:8 silver photocorners per invitation set.